Join the Mythgard Movie Club on February 22, 2018, at 8:30pm ET for a discussion on the 2005 film version of The Hitchhiker's Guide to the Galaxy, starring Martin Freeman, Zooey Deschanel, Sam Rockwell and Mos Def, featuring the voices of Stephen Fry and Alan Rickman, and directed by Garth Jennings. 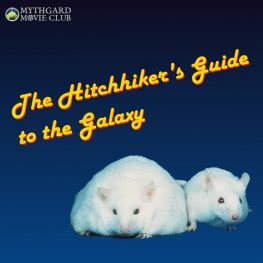 Join the Mythgard Movie Club on February 22, 2018, at 8:30pm ET for a discussion on the 2005 film version of The Hitchhiker’s Guide to the Galaxy, starring Martin Freeman, Zooey Deschanel, Sam Rockwell and Mos Def, featuring the voices of Stephen Fry and Alan Rickman, and directed by Garth Jennings. The film script was co-written by Douglas Adams and Karey Kirkpatrick, although Adams passed away in 2001 before production on the film began. While the film did moderately well commercially, more than doubling its $50 million budget with nearly $105 million in box office sales, critical reception of the movie adaptation are generally mixed. Several critics noted the reliance on source material, and many seemed put off by the humor (or attempted humor), which seemed to them not to come across as well in the movie as it does in Adams’ books – or, as one BBC reviewer put it, “The Hitchhiker’s Guide to the Galaxy is not as bad as I had feared. Then again, it is not as good as I had hoped.” Our movie club panelists – who have all read the book – will discuss these and other reactions to the film, along with their own insights, interpretations and introspections. Corey Olsen, aka The Tolkien Professor, is founder and President of Signum University and the Mythgard Institute. He promotes open courses for literature analysis, and frequently publishes free podcasts and seminars analyzing Tolkien and other works. His book Exploring J.R.R. Tolkien’s The Hobbit was published in September 2012. Corey Olsen holds a B.A in English and Astrophysics from Williams College and a Ph.D in medieval literature from Columbia University. He has previously taught at Temple University, Columbia University, Nyack College and Washington College. Dominic Nardi is a political scientist who focuses on judicial politics in Indonesia. He worked as a consultant throughout Southeast Asia. He received his PhD from the University of Michigan and JD from Georgetown University. In addition, he has published articles about politics in Star Wars and The Lord of the Rings. You can find more of his writing at NardiViews.